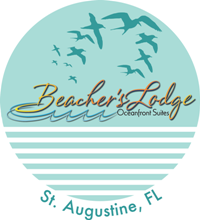 In operation since 1986, Beacher's Lodge is a condo-hotel located on Crescent Beach in St. Augustine Florida. We understand the importance of keeping up with renovations. Our owners are dedicated to the continuous improvements that keep our rooms pleasant. Many repeat guests have their favorite suites, which they request year after year. All the oceanfront suites have a patio or private balcony overlooking the Atlantic Ocean. The privacy of a separate bedroom can be appreciated when children or friends are sleeping on the sleeper sofa in the living room. The kitchenettes make cooking an option. In addition to our one-bedroom suites, we also have studio suites, which provide comfortable affordable accommodations and offer easy beach access. If the waves of the Atlantic Ocean keep you at bay, then our oceanfront heated pool may be just what you need. Steamy in the winter and refreshing in the summer, our pool always provides a beautiful view of the ocean. This area of St. Augustine is known as Crescent Beach, large expanse of white sand always makes for memorable enjoyment. Whether you enjoy the water or the quiet beach walks, that invigorate the soul, we know you will like it here at Beacher's Lodge. Queen Suite with a private bedroom featuring a queen bed and cable TV. The living room has a queen sized sleeper sofa, cable TV and equipped kitchenette. All units have a DVD player. The kitchenette has a refrigerator, stove top, microwave, coffee maker, toaster, pot/pans/dishes/utensils. Daily coffee provided for 4 cup coffeemaker. There is a sliding glass door in the living room that leads out onto a balcony. Limited Pet Friendly Accommodations must be Requested at time of redemption and are based upon availability; not guaranteed. (Additional fees and restrictions apply and are not included in the auction).